Mumbai’s street food culture is as varied and cosmopolitan as its population. Having an affair with the street food is one of the things to do in Mumbai City. The Mumbai street food guide is as chock-a-block with food items of multiple flavors as the cityscape is dotted with the things to see. The multi-spice flavors of Mumbai street foods like Pav bhaji, Vada pav, Kheema pav and Bhel puri reflect the city’s multiple facets. A must mention is that most of the street-side food stalls serve gastronomes from morning or noon till wee hours. At Indian Eagle, we recommend five of the best Mumbai street foods to our customers who have flown to Mumbai this Ganesh Puja festival. Pav bhaji is the first pick from a Mumbai street food guide. With soaring popularity among the locals and tourists, it has become an icon of Mumbai City. It is tangy, sour and spicy with lemon extract. 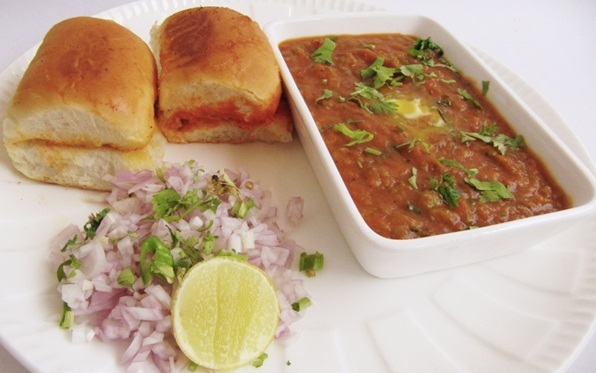 Pav bhaji is a dish of fluffy bread slices smeared with butter and mixed vegetable gravy. It is a must taste for those on a culinary tour of Mumbai. Sardar’s at a stone’s throw from Mumbai Central Station is one of the best places to have finger-licking pav bhaji. 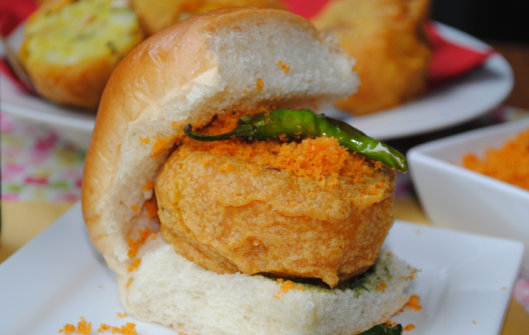 Vada Pav is another must-have street food in Mumbai. It defines the native taste of Mumbaikars. A delicious grab-and-go snack for the locals, vada pav is a mashed potato patty sandwiched between two slices of fluffy bread. What makes this snack a luscious twist for taste buds is the potato mash spiced with a mix of garlic, chilies and coriander. Vada pav is served with coriander chutney. Anand near Mithibai College on Gulmohar Road is one of the best destinations for vada pav lovers. Chicken tikka roll, a famous member of the Mumbai street food family, stands higher on the taste quotient. 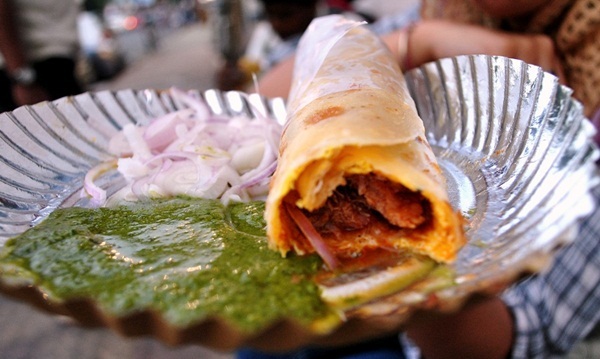 Chicken tikka roll is so popular with Mumbaikars that they swear by its relish to pride themselves on being foodies. It is a roll of thin and soft roomali roti (flat bread made from refined flour), wrapped with meat inside and stuffed with a mix of ingredients. Mumbai’s favorite destination for the best chicken tikka roll is Bademiya, an open-air kitchen on wheels behind the Taj Mahal Palace Hotel. Bhel puri is the best flavor of beachside evenings in Mumbai City. Though a common anytime snack, bhel puri makes an evening walk with friends a pleasant experience. It is a crunchy, spicy tongue-teasing item mixed with fried lentils, onion slices, tomato slices, boiled potato slices, sev, tamarind chutney and coriander leaves. 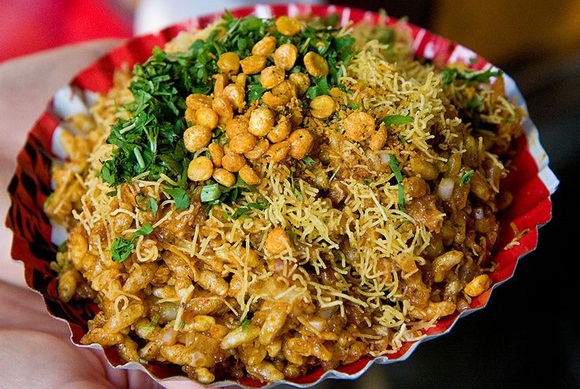 Most street food vendors in Mumbai sell their own variations of bhel puri in different flavors. Chowpatty Beach is the ultimate bhel puri destination in the city. Mumbai has a sweet tooth for pav. Kheema pav is a rich, spicy pav dish again. 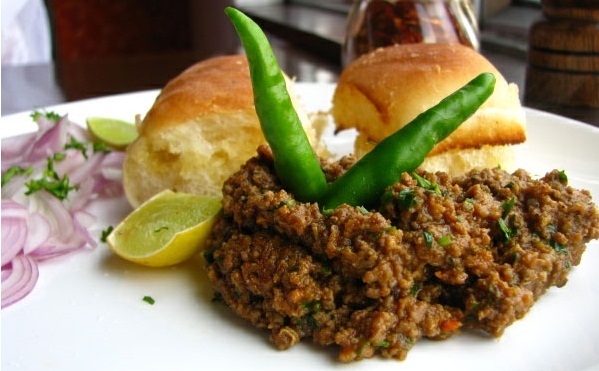 Colaba is more famous for kheema pav than its tourist spots in the city. The locals, tourists, foodies and travelers mop up plates of kheema (fried minced meat) with slices of fluffy bread. It is a favorite of Mumbaikars for breakfast. A visit to Colaba is best complemented by gastronomic experience of kheema pav near Olympia Coffee House in Rahim Mansion. Besides useful travel tips and ideas, Indian Eagle offers cheap flight tickets for Mumbai with Delta Airlines, United Airlines, British Airways, American Airlines, Air India and Etihad Airways from major US cities. You can check airfare deals for Mumbai on IndianEagle.com or call us at 1800-615-3969.